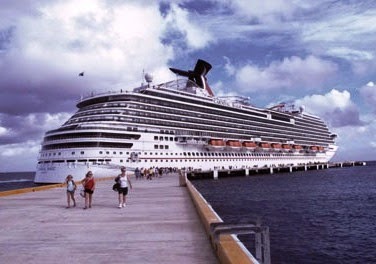 Disembarking the Carnival Magic at port. If you’ve never been on a cruise you might envision a ship full of gray heads lounging by the pool in overstuffed bathing suits and overindulging in ever-available food and drink the rest of the time. And you’d be very wrong! Cruising has become a vacation of choice for families and multi-generational gatherings. Here are some reasons sailing the seas could become your perfect family getaway. 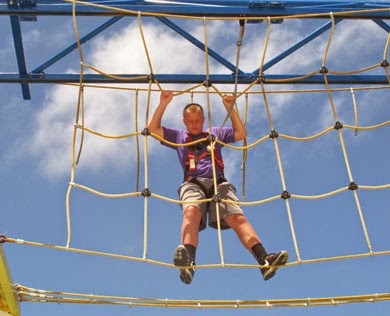 Get a little daring on the ropes course! Book once and done: A cruise ship is the ultimate all-inclusive vacation spot. Once you’re on the ship there’s no more schlepping luggage onto planes or taxis or checking into multiple hotels when driving on the road. You have control over any extra expenses, too. 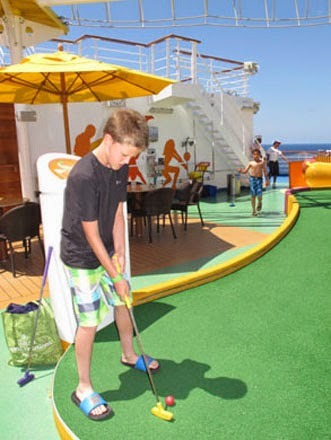 Miniature golf is a favorite activity for all ages. No time to get bored: From age-appropriate children’s programs that entertain the kiddos to adults-only sections of a ship, there are so many activities onboard that choosing what to do next will be the hardest part. 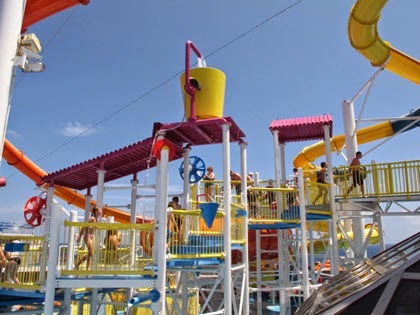 Climbing walls, ice skating rinks, surf simulators, miniature golf, water slides, ropes courses, and much more are fun for all ages. Broadway-style shows, bingo, casinos, and art auctions will keep grown-ups entertained, while kids do arts and crafts, play sports, or have pizza parties. 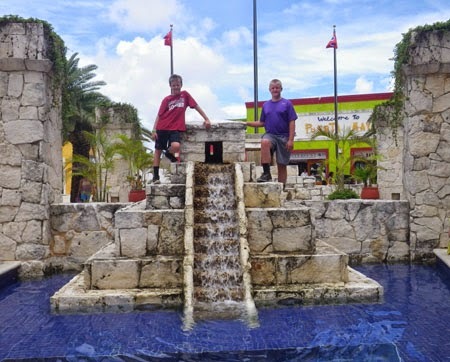 Try something new onshore: One of the best things about cruising is that the ship stops at a variety of ports, and each features a plethora of excursions to help you explore and discover the uniqueness and beauty of each place. Think of all the memories you’ll make while kayaking, zip lining, snorkeling, or just strolling the streets of an exotic tropical island or historic city. These one-day stops provide glimpses of destinations that you might want to come back and visit again. 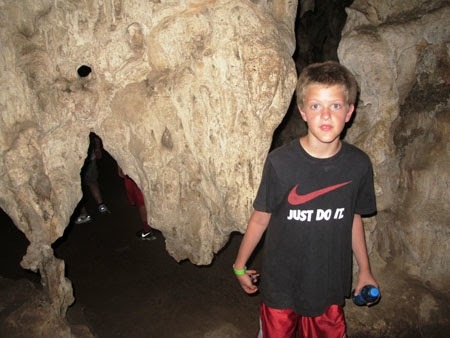 Exploring a cave in Belize. Suit your style: If your idea of a vacation is sipping a cool drink while catching up on the romance novel you’ve had on the nightstand for months, there’s plenty of opportunity to do that. Let older kiddos roam on their own (walkie-talkies can keep you in touch) while younger ones participate in supervised activities at kids’ camps. Then sit back and relax. Together or not--your choice: Adjacent cabins and family-friendly rooms and suites are convenient—keeping everyone together while allowing for some separation, if needed. More cruise lines are catering to families, so cabins sleep more people and there’s more bathroom space. Onboard you won’t have to worry about getting lost or separated as you’re all on the same ship. Because some of the new mega-ships can carry 5,000 passengers, you might need to set up occasional meeting places. Smaller ships may be able to custom-tailor excursions for your family. Cruising is a great value: Increased demand and larger fleets of ships have brought prices down as cruise lines try to fill all their itineraries. Packages are often available that include onboard credits that can be applied to shore excursions, spas, and shopping or free Wi-Fi (a good deal because connecting online can be quite expensive onboard). With a large inventory of cruise options, including destinations, length of cruise, type of cabin, and more, finding one that fits your family’s needs and budget should be easy. If you need help, check with a travel agent or an online cruise consolidator whose experts can find the perfect vacation for your family.